Pinot Noir is a dangerous grape. It gets you hooked, and once you’ve succumbed to its charms it’s like living with an unfaithful partner. You get the highs, but you also get the lows. It makes you wish you’d shacked up with more reliable grapes, such as Cabernet Sauvignon or Shiraz, but while these varieties are unlikely to treat you so badly, they just don’t provide the same thrills. Pinot makes you feel alive; it takes you to places you’ve never been before. You never know quite what’s coming, and this makes the bad times you’ll inevitably get with this grape bearable. 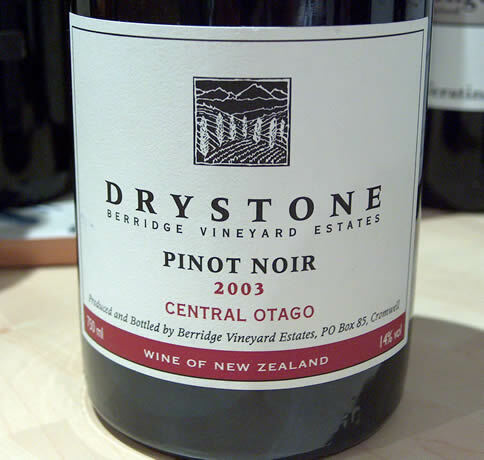 Central Otago, one of the most southerly vineyard areas in the world, does Pinot Noir very well. We have Burgundy, we have a few cooler spots in California (Carneros, Russian River Valley, Santa Ynez Valley), and then there’s Central Otago and Martinborough in New Zealand. These are most of the places that can make magical Pinot Noir. I guess there are a few more, but not many, and not as consistently. Pinot Noir is extremely fussy about where it grows. What do we look for in top Pinot Noir? First of all, it should not be too dark in colour. If it’s a deep purple/black, something has gone wrong. This wine is a mid red/purple colour with a tiny bit of fading at the rim. Second, it should be perfumed. Top Pinot Noir is exquisitely perfumed, with bright fruity aromas in its youth gradually succeeding to a more earthy, undergrowthy bouquet. Often there’s some spicy structure on the nose, particularly where stems have been included in the vat. This can sometimes be mistaken for woodiness. This wine shows a brightly perfumed nose of bright, herby cherry and berry fruit, with some spicy, tarry complexity. The vivid herby fruit dominates. Third, Pinot Noir should be elegant. Elegance in wine is hard to define. Show me an elegant wine, though, and I’ll tell you what it is. On the palate this wine shows vibrant berry fruit with smooth structure and lively, almost zingy acidity. There’s some spicy, herby complexity and just a touch of structure. It’s a textbook Pinot Noir and, yes, it’s quite elegant. I think it will age very gracefully: the bright acidity should confer a long-ish life on this wine. Above all, it’s very tasty. It’s ripe, but it’s not jammy. Pinot Noir should never be over-sweet and jammy. Tasted blind I reckon I’d certainly pick this as a Pinot Noir, and likely spot it as New World. I doubt I’d do any better than this. It’s a satisfying, more-ish sort of wine that would match a wide variety of foods. A terroir wine? Well, I’ve never visited Central Otago, but in this wine I see a wide, open vista, with a bright, pure blue sky and a fresh breeze in the air. Cold fresh running streams. It’s a frontier wine, grown at the limits, with the character and sinew of vines that have had to fight to ripen their precious load. It’s unfettered by the demands of tradition; proud in its own right, making its own statement about who it is. There’s some sweetness to the fruit, but not too much, with a pleasing bitter, almost sour character providing tangy balance. How does it rate? I like it a lot. If you’re going to force me to try to quantify this, I’d have to say about 92/100. Imported into the UK by Hellion Wines (www.hellionwines.com).